I spent a few weeks gathering and translating the pictures of Jules Huret's l'Allemagne Moderne showing Germany just before World War I, which proved to be as well-received as I had hoped. Jules Huret has another book that can be found on Archive.org that is of the exact same format called l'Amérique Moderne, showing the United States as he visited it just before. Since it is from the same era that interests me so much I've started gathering and translating these pictures as well, and will publish them 100 at a time until they are done. Since this book is also about the same size it should end up with some 500 or so images by the end. Edit: final count is 533 images. 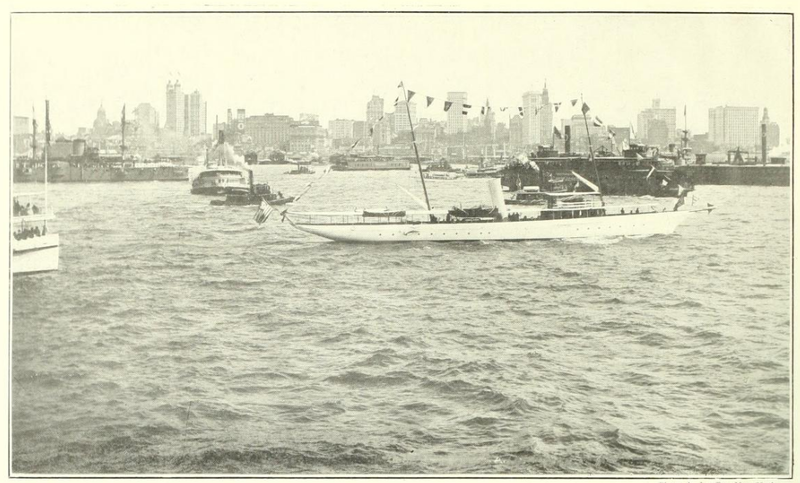 Huret's account begins upon arrival in New York. First view of the city when arriving at the port. -- You could almost believe yourself to be seeing gigantic sets of dominoes lined up on the banks of the Hudson that could be knocked over with the tiniest shove. 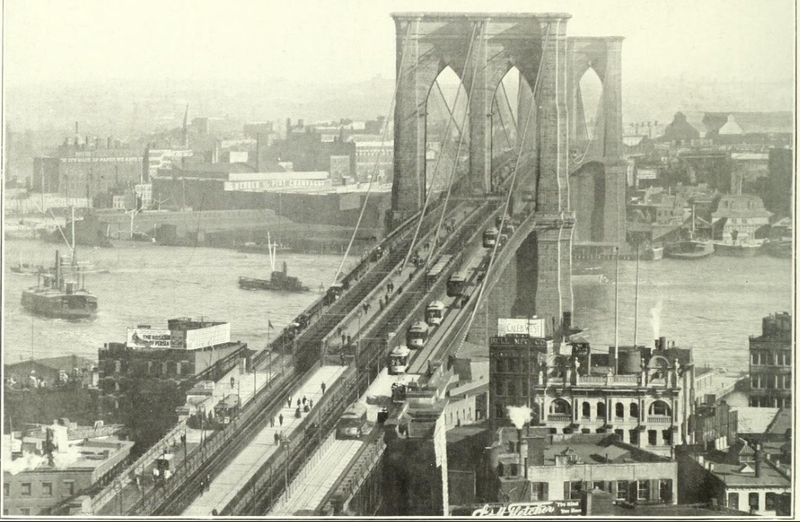 Brooklyn Bridge, or East-River Bridge. -- 1025 meters long and 26 meters wide, it rises up 41 meters above the river. 70 million people pass over it per year, and cost around 75 million francs to build. Downtown, around Broadway. -- This is the district with places of 10, 20, 25, 30 stories in height. 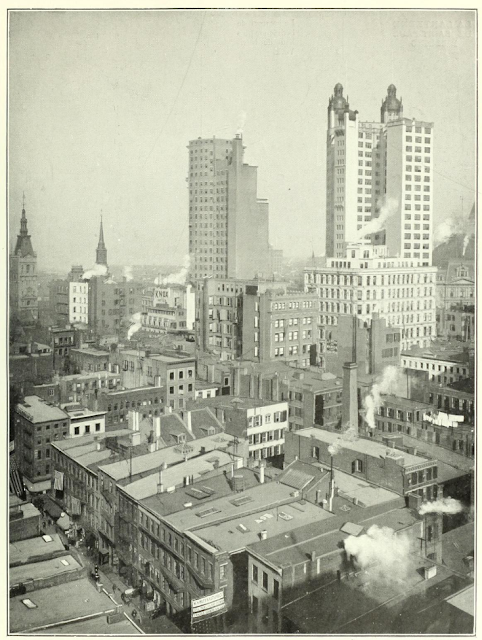 The two buildings that surpass the others are Row Building, and St-Paul Building Park. This last one is no less than 30 stories. 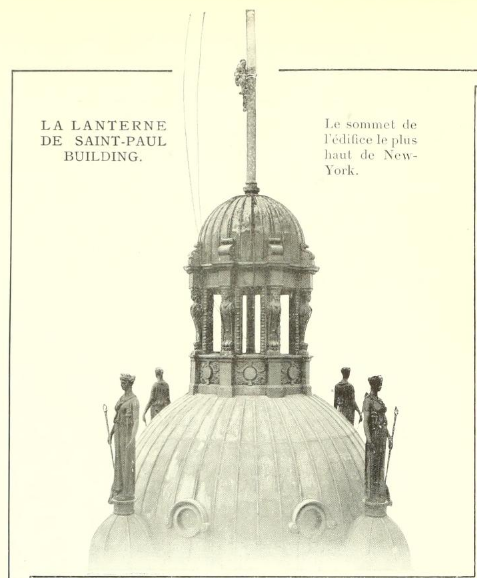 The lantern of Saint-Paul's building, the top of the tallest building in New York. Saint-Paul Park. 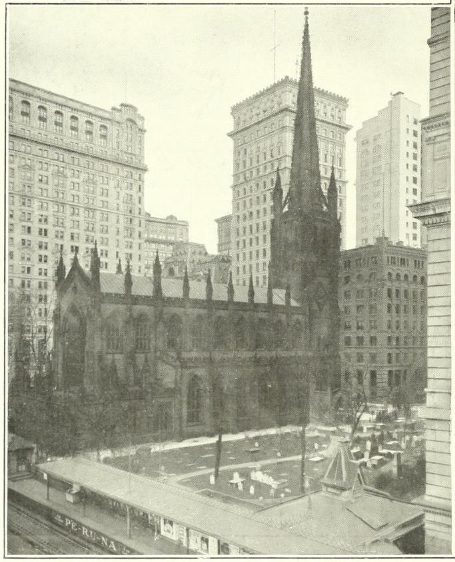 -- The spire of this church hardly rises to the level of the top of its powerful neighbors. 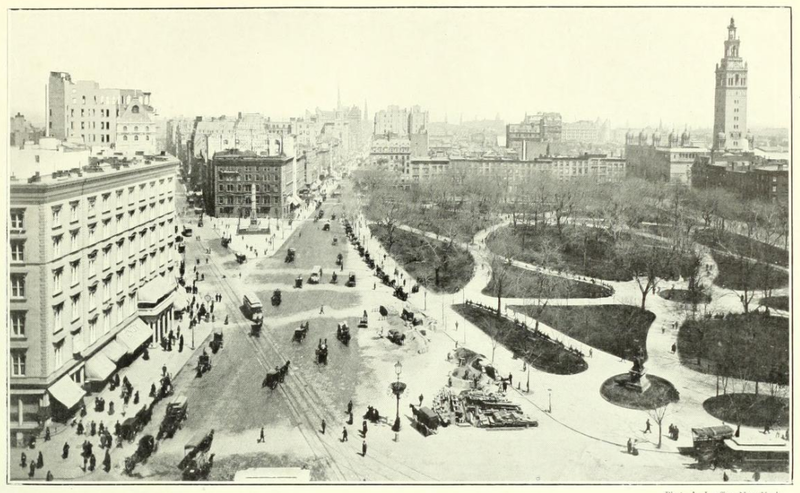 The Flat Iron juts out as a peak, at the corner of Madison Square. Madison Square. -- The straight road is the famous 5th Avenue where the hotels of the multimillionaires are found. The slanting road is Broadway, which goes through the whole city, running some 30 kilometers. 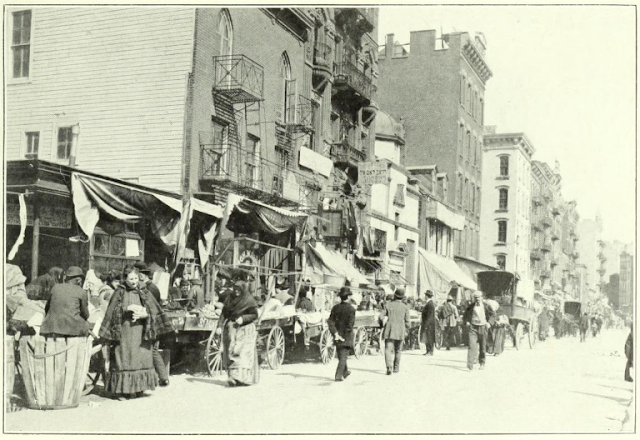 East Side, New York's populous district. -- Fires are so common in this district that, for safety, the different stories of the buildings are connected by iron ladders. New York Harbor seen from the top of a skyscraper. 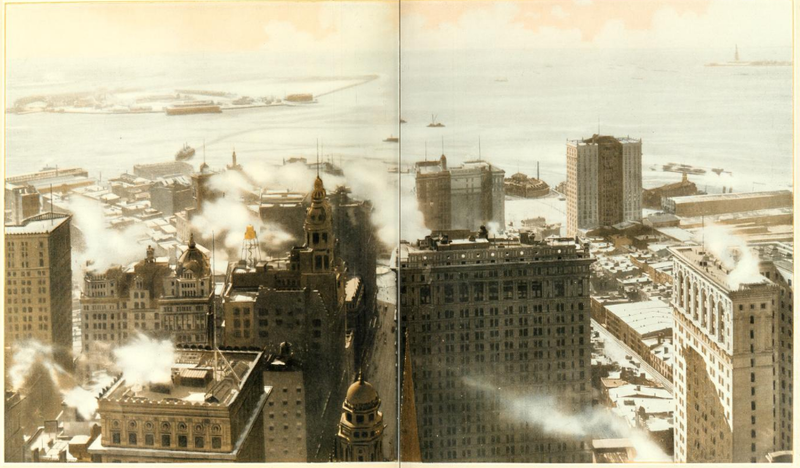 -- From the top of the vertigo-inducing buildings of the city the magnificent view extends to the port and the harbor which, towards the sea, closes around the colossal statue by Bartholdi. When snowing, like in our photograph, this panorama is even more impressive. 5th Avenue under the snow. 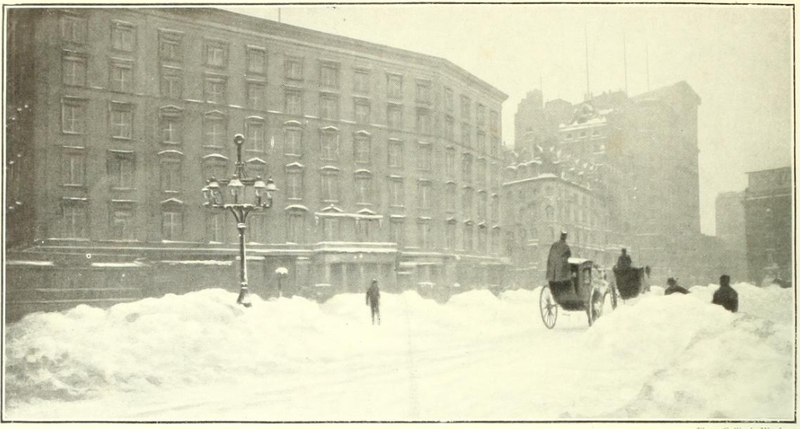 -- Winter in New York is extremely harsh, a large amount of snow often invades the streets, intercepts communications and puts a stop to the intense life of the giant city. 42nd Street. -- Center of the city and close to central station. 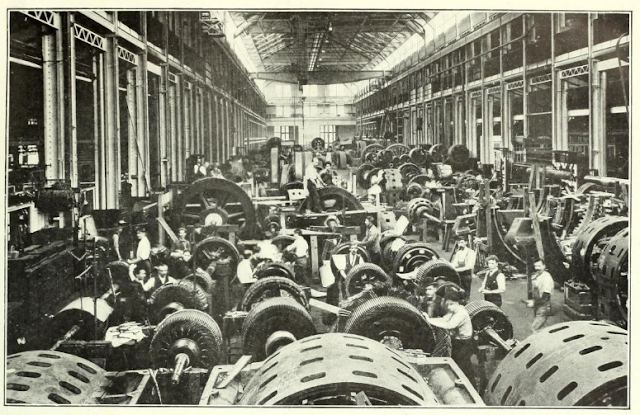 This is the area where the industrious New York crowd gathers. 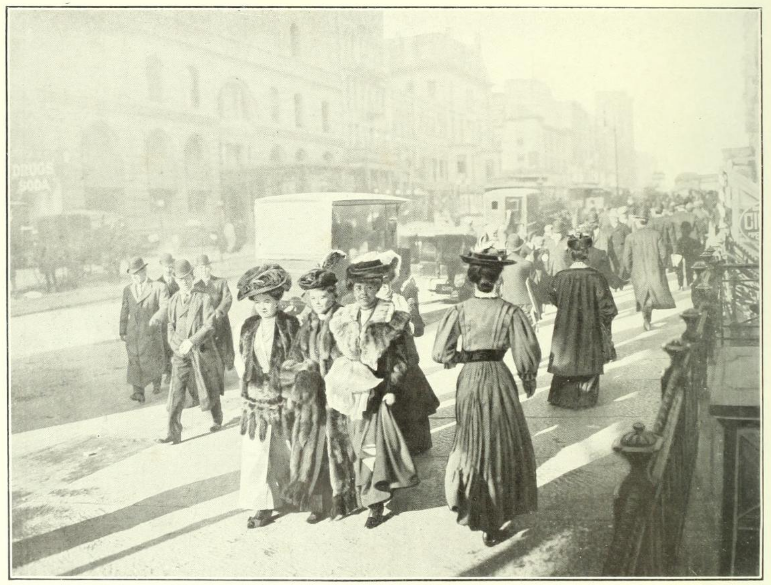 Their day finished, bank employees and pretty shopgirls flock in their haste to get back home. 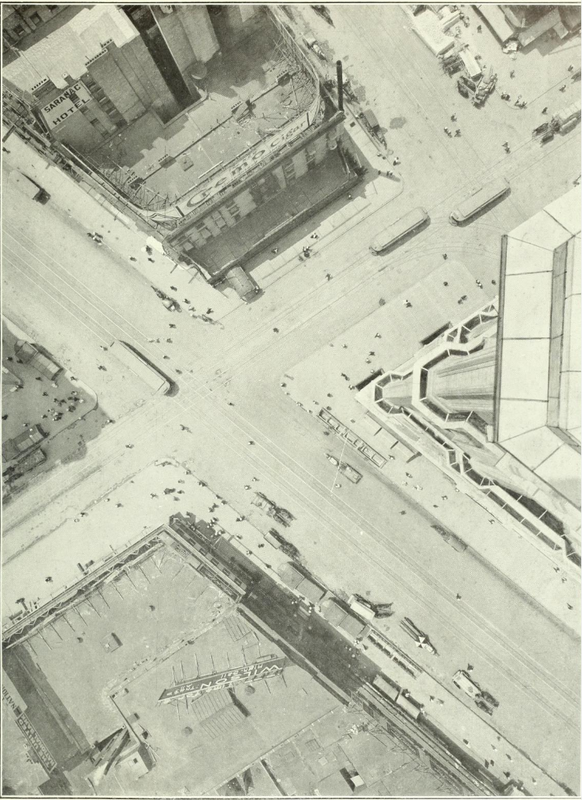 View of a New York intersection, taken from the top of one of these "skyscrapers". The cars and tramways look like nothing more than insects, and passers by are just hardly perceptible spots. 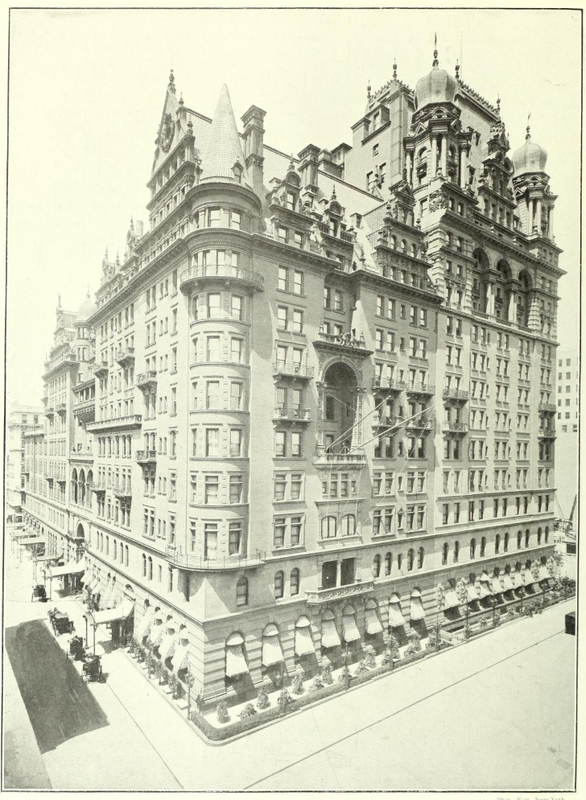 A large New York hotel. 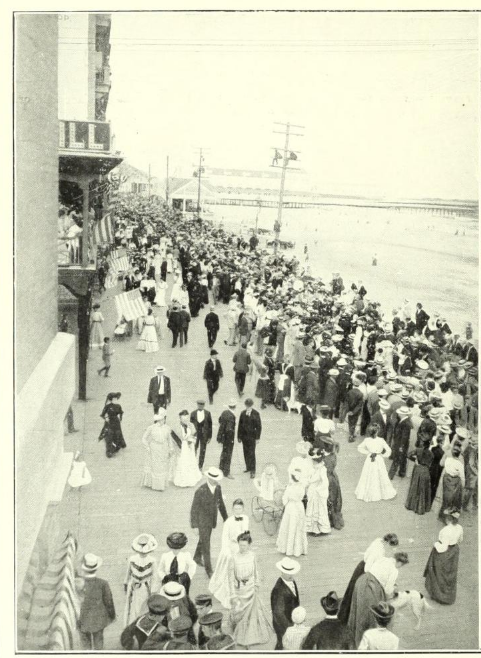 -- The hotel shown in this photograph counts no fewer than 1500 rooms and employs 1600 workers. With construction and furnishing it cost the pretty sum of 40 million. The garden hall with its large bay windows, marble columns and floor with doubled balconies, has an incomparable sumptuousness. The office of a large hotel is, in New York, as large as that of a European state. 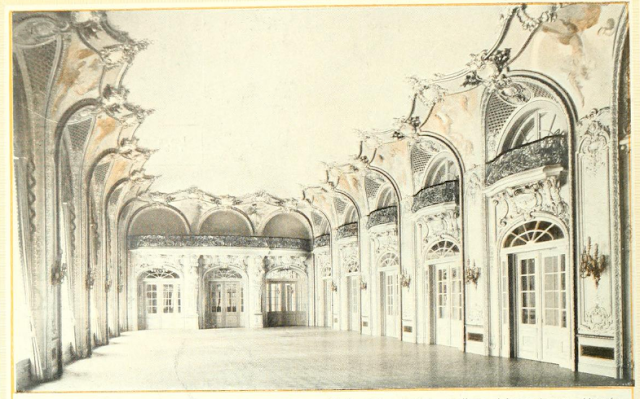 The festival hall of a large hotel. -- This magnificent hall of an unheard of richness, decorated by large paintings from Europe, has seen all of the aristocracy pass under its paneling. A French café in New York. -- This café is also the most esteemed restaurant in the city for its comfort, delicacy of its French cuisine, the luxury of its dining rooms and salons. Broad Street. 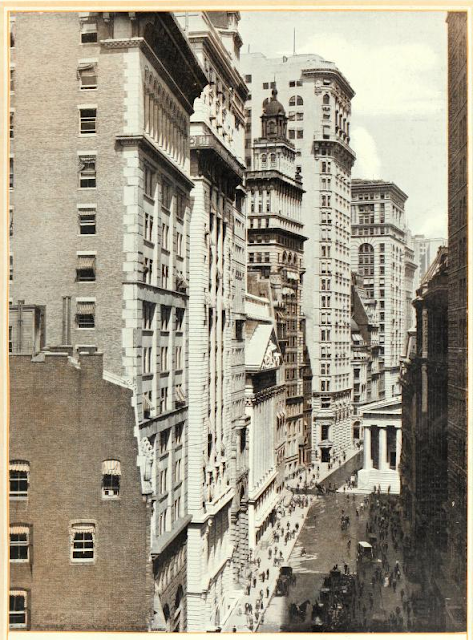 -- Broad Street is the most lively street in the city and the center of business. 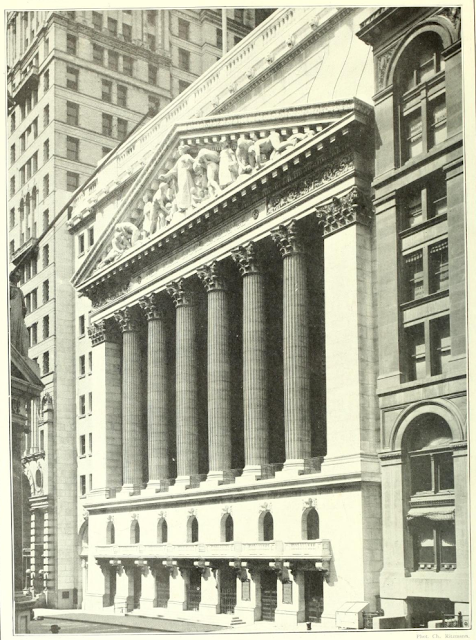 "Sky-scrapers" abound here, where the large trusts, banks, newspapers and the Stock Market are located. The Stock Market. -- Somewhat mediocre as architecture, this monument plays a preponderant role in the economic being of New York, and where you can see in the same day great fortunes be built, or destroyed. The Treasury. -- Before this monument with an architecture resembling that of the Stock Market in Paris a bit, rises the statue of Washington. Billions in money is handled here every year. 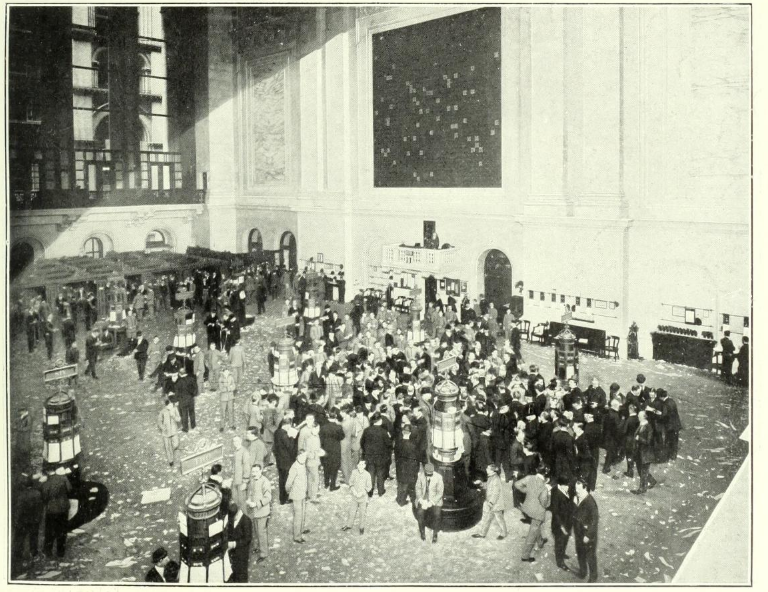 The inside of the Commodity Exchange. -- Around the trading post in this hall for speculation, affluence is enormous and animation is considerable during the hours where business is carried out before noon. At a stockbroker. 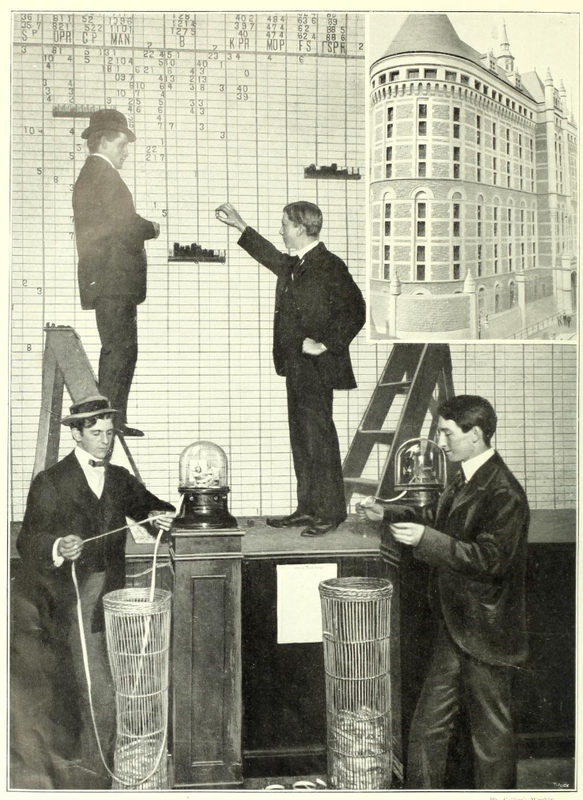 -- Special telegraph machines transmit the values of the Stock Exchange that employees write on large boards. Top right: New York's new prison. Official and private police. 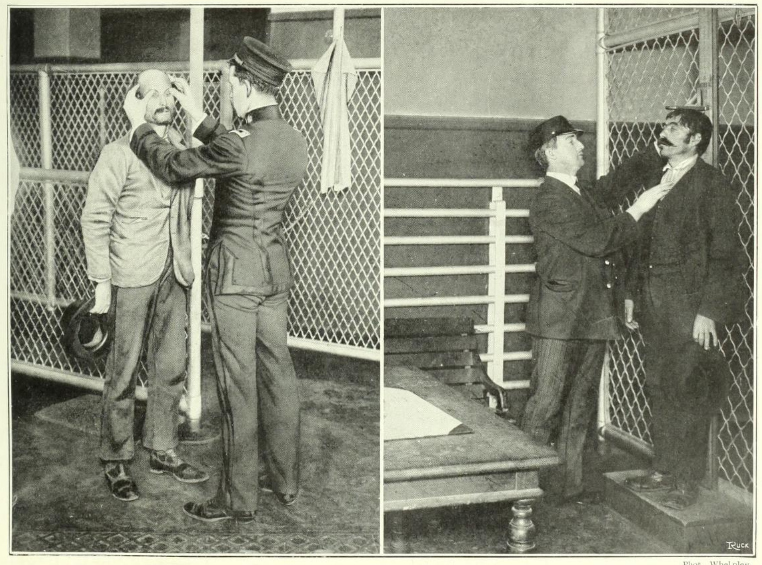 -- Above: Mr. Jerome, head of the police in New York. Below, from left to right: M.P. 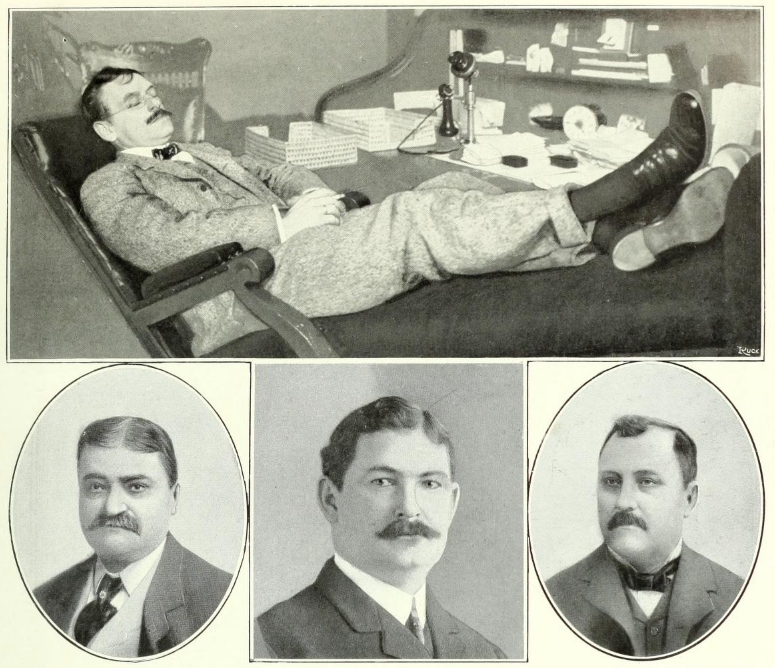 Pinkerton, director of the famous agency, M. Dungerly, detective, and M.B. Pinkerton. A fake check. -- This check for 300,037 dollars made by a skilled counterfeiter, was paid upon presentation. 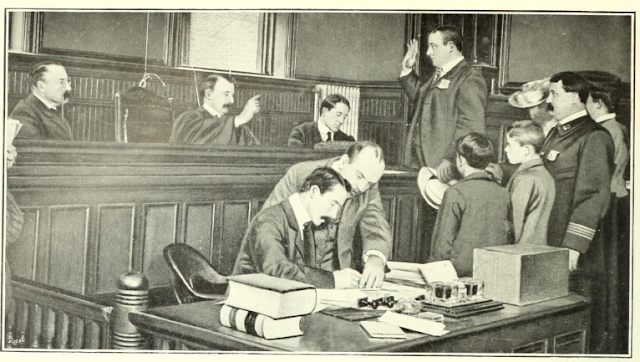 The thief and the money were found by a skilled detective from the Pinkerton agency, three days after discovering the theft. Coney Island is the popular american beach. 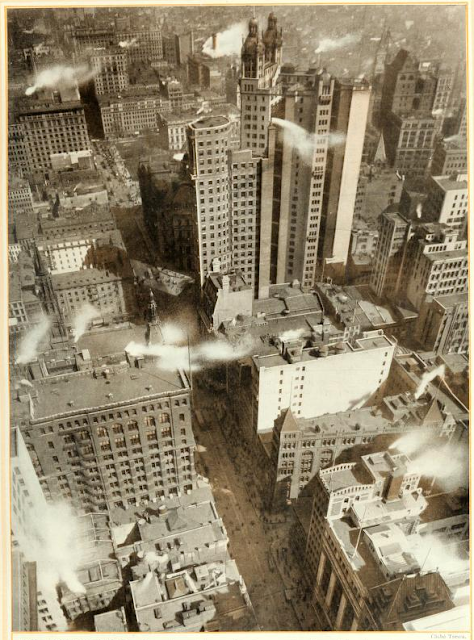 During the months of summer 100,000 people who have slaved away in the intense work in New York come to find rest. Two famous bandits and their anthropometric records. -- Camille Hanks (left), the famous train robber. He was killed defending himself against the police trying to arrest him. William Stanley (right), a young bandit more known under the name of St. Paul Tip, killed a number of police agents. Counterfeit for 22,000 dollars (120,000 francs). This bill, actually for 12 dollars, was transformed by Charlie Becker into a value of 22,000 dollars. It was the Pinkerton agency that found it and arrested the counterfeiter. (Left) Charlie Becker, whose skill has given him the name the kind of counterfeiters. (Middle) Fragment of a 20 million dollar false banknote. (Right) Topeka Joe, who uses explosives to blow up the safes of banks. 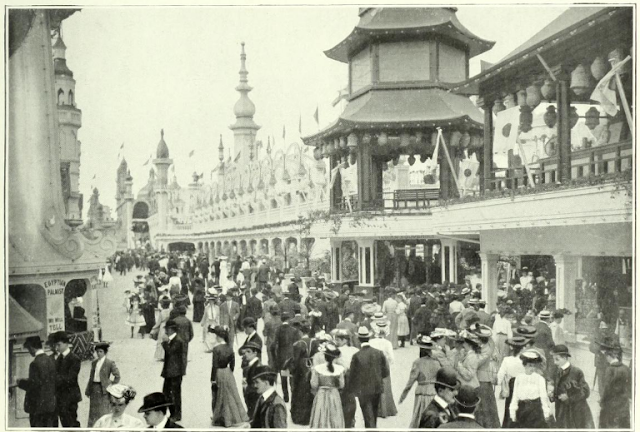 Luna Park during the week. -- Glued to his work by the rigors of the intense life he leads, the American takes no leisure during the week at Luna Park, where its deserted streets resemble an abandoned city. Luna Park on Sunday. -- What a change on a holiday! 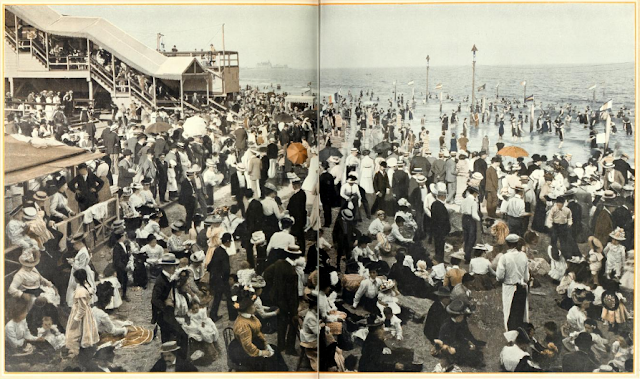 Invaded by a compact and noisy crowd, the white city awakes from its torpor and fills with movement, laughter and cries. 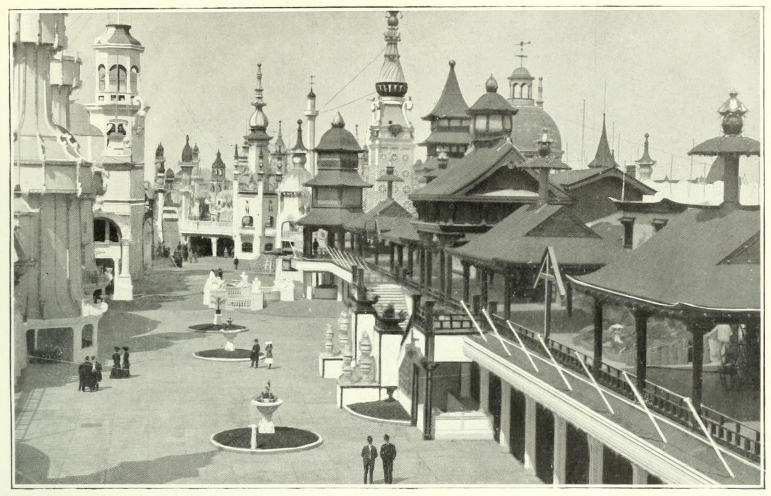 Luna Park. -- The main area of Luna Park is the amusement center. A weird architecture blooms there, gaudy with violent colors that excite the crowd on Sundays. Atlantic City. -- One of the popular beaches on the Atlantic. 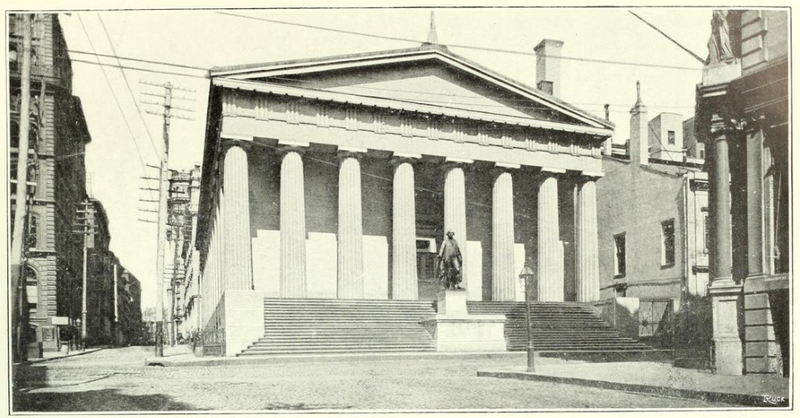 It is particularly frequented by the residents of Philadelphia. On Coney Island. -- A drum major of imposing height. 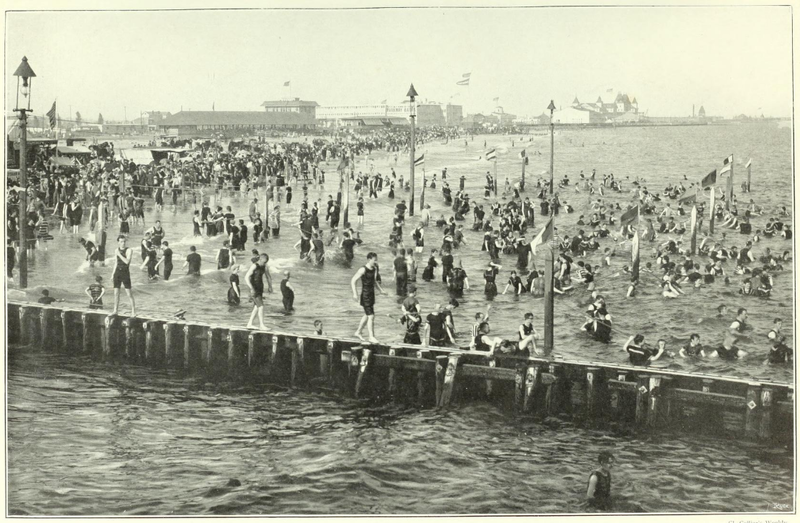 Coney Island beach. 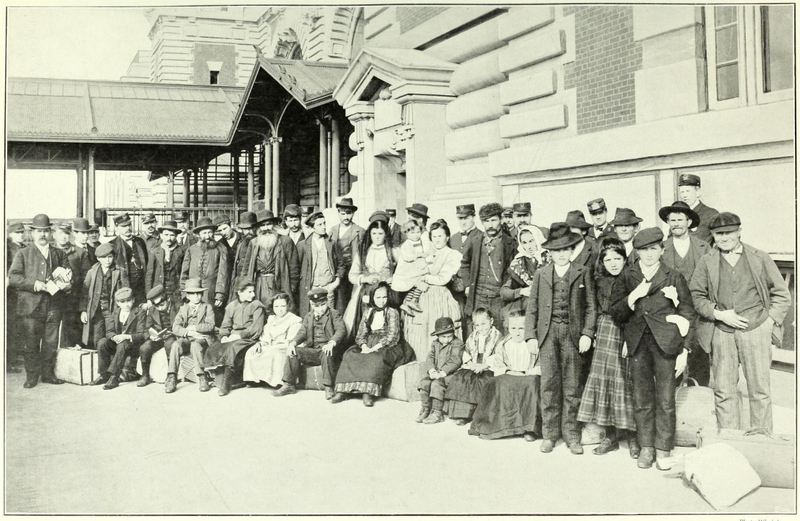 -- The working population of New York finds here along, with a healthy atmosphere, attractions of every time. It's sort of like Neuilly but permanent and with more animated than ours in France. Luna Park in the evening. 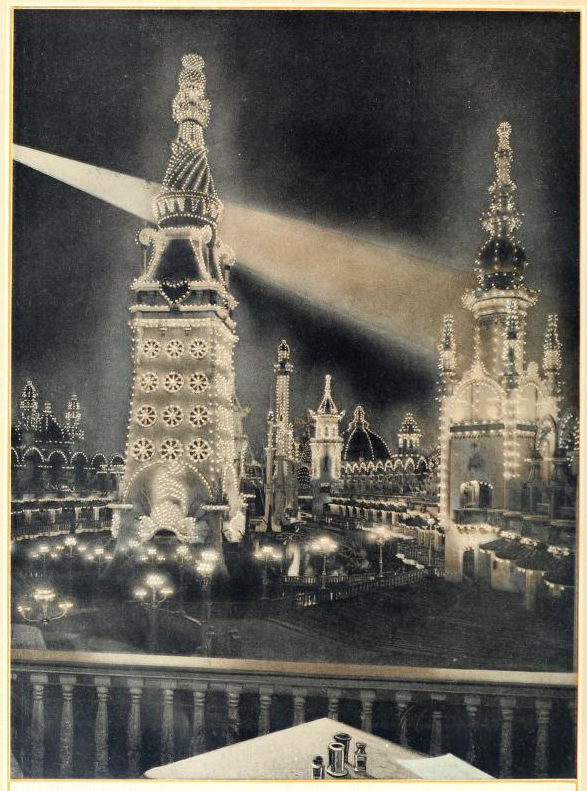 -- The fantastic buildings of Luna Park with an Arabic feel take a thousand fairytaile-like forms at night under the intense multicolor illumination surrounding them. The "skyscrapers" -- These buildings with a fairly banal architecture produce by their piling up of one story after another an impression of grandeur and real beauty. Some stars. 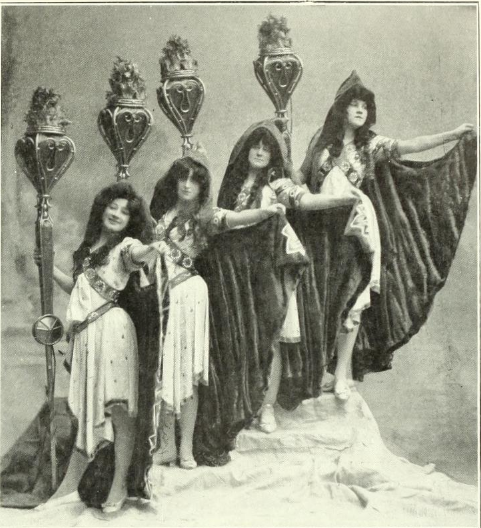 -- From left to right: Misses Mabel Canier, Fisker, Ida Beach, and Bessie Clayton. Chorus Girls. -- These six elegant young women entertain the transatlantic public with their doll-like and clownish gestures. 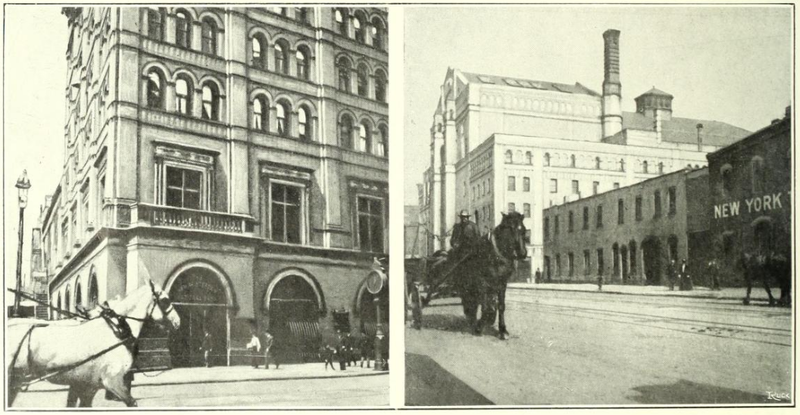 Two sides of the Metropolitan Opera. -- This theater where the most famous stars gather does not have a very grandiose look on the outside, and the architectural detail is lost in the narrowness of the street. 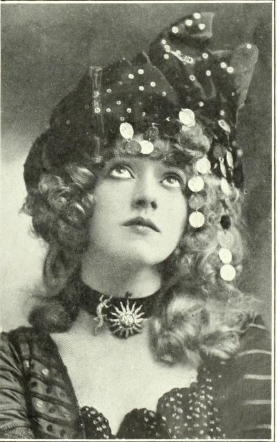 Julia Marlowe, the Sarah Bernhardt of America. Electric Ballet. -- This is America where the dances are original and thrilling. During intermission. 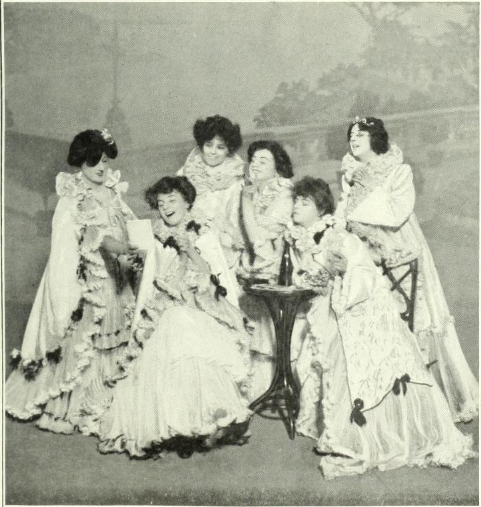 -- The young chorus girls in a small group with their racy expressions. Bessie Clayton, the prettiest of American dancers in vogue now. Lakewood Castle belongs to George Gould, one of the multimillionaires whose name is best known in France. He holds magnificent festivals in this lordly residence. 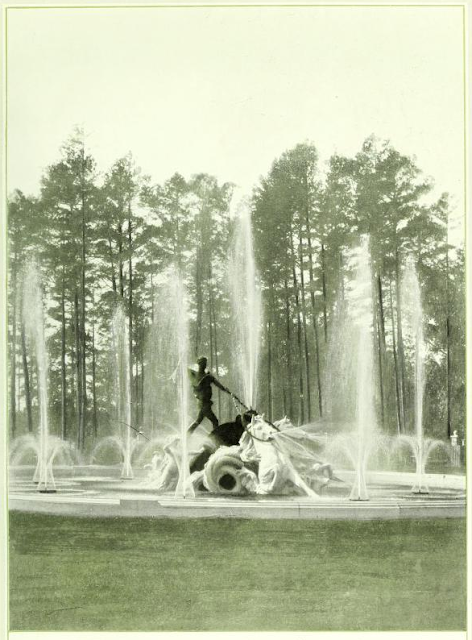 The fountain. -- This group of bronze and marble occupies the center of the large pool in Lakewood garden. 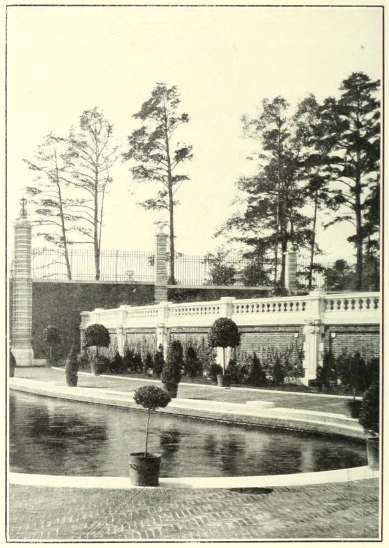 The large pond and the handrailed terrace with white marble chairs at Lakewood. Lakewood Castle: 1. 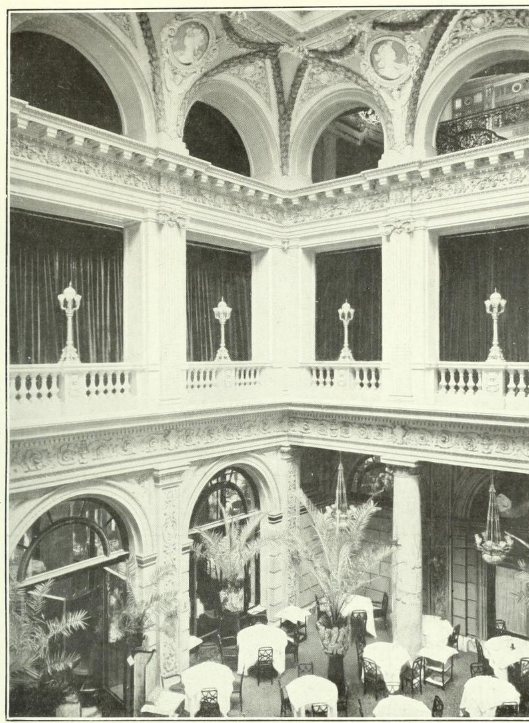 The arcade. 2. 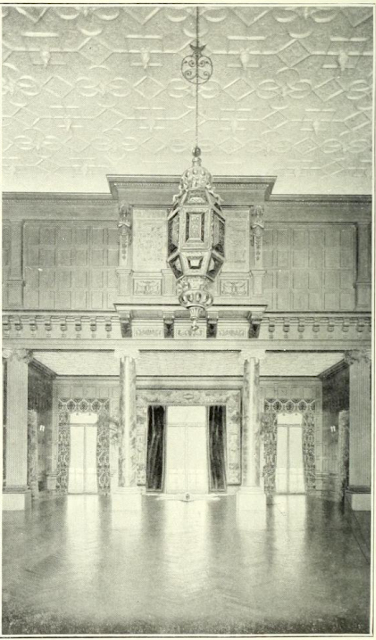 The great lounge. 3. Bedroom. -- These rooms have an unheard of luxury, with Beauvais tapestries, an unlimited number of masterful paintings, and admirable bronzework. Lakewood Castle. The gardens. -- In this magnificent castle French art is the master. 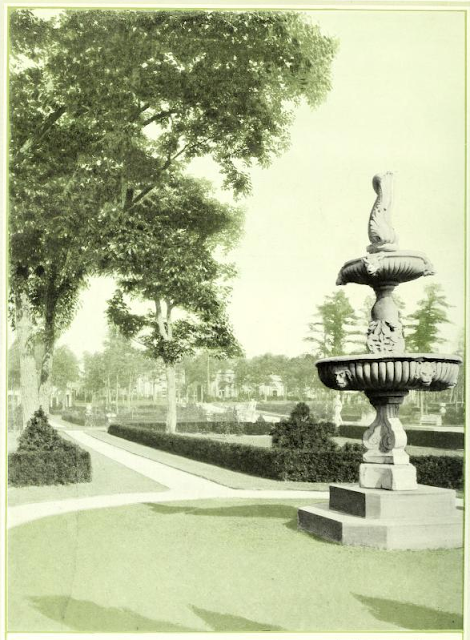 The lanes and parquets have especially been designed on the same plan as the famous gardens of Versailles. Lakewood Castle. The pond. 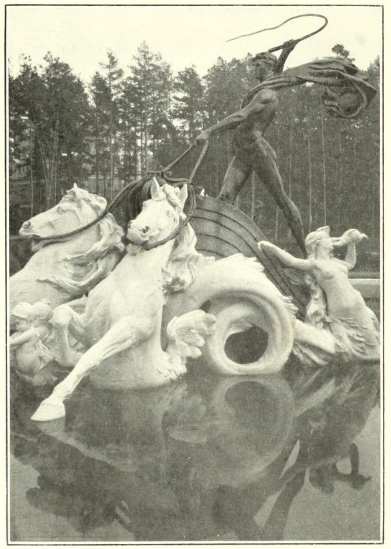 -- There's more Versailles to be found at Lakewood in its ponds: the two sailors, tritons, and naiads of fantasy. Left: Mrs. Rockefeller is very plain and does a lot of good with her immense fortune. 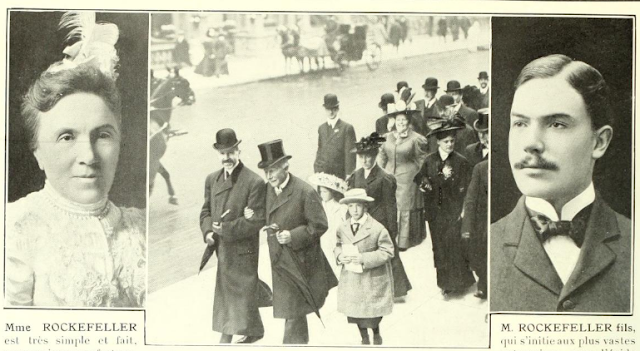 Middle: Mr. Rockefeller on promenade. Despite his age, the famous billionaire loves to walk. Right: son of Rockefeller, who starts a lot of business ventures under his father's aegis. 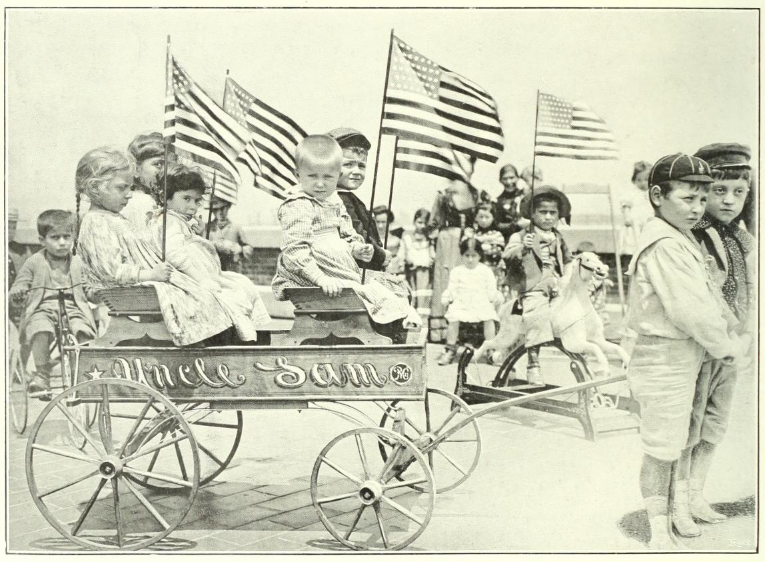 Left to right: Mr. Harriman, who was king of railways that crisscross America. Mr. Rockefeller, the oil king, the richest man in the world. Mr. Andrew Carnegie, the king of steel, of a famous generosity. Mr. Astor, the king of iron, whose fortune was particularly quickly gained. Left to right: Duchess of Chaulnes, born Vanderbilt. 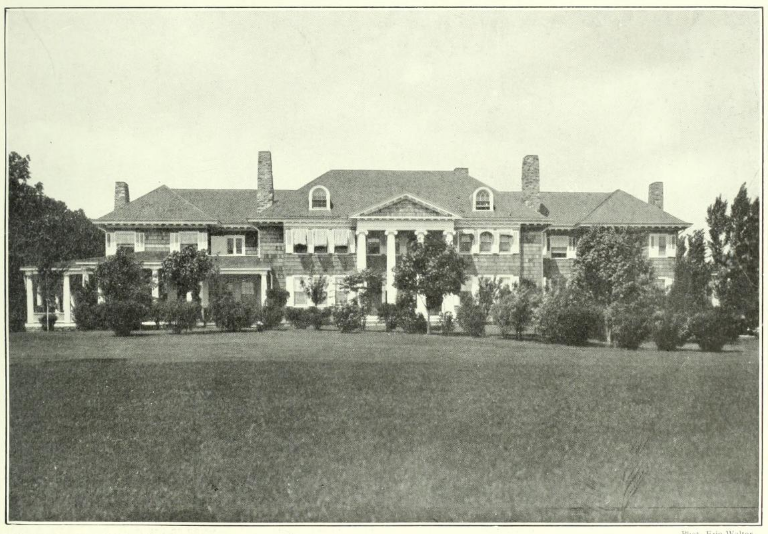 Mrs. Ketty Green, New York's great landowner. Miss W.K. 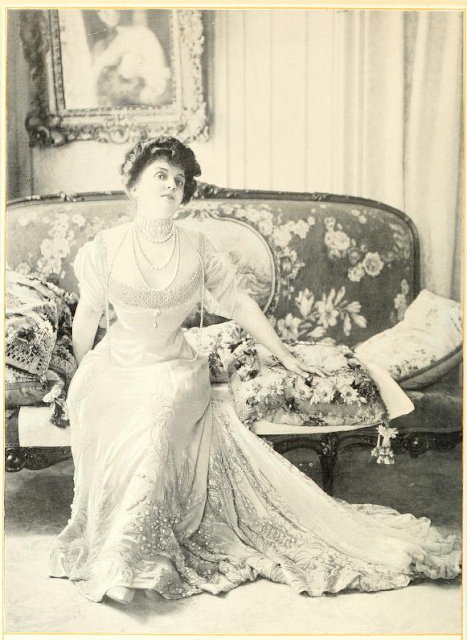 Vanderbilt, one of the richest heiresses. 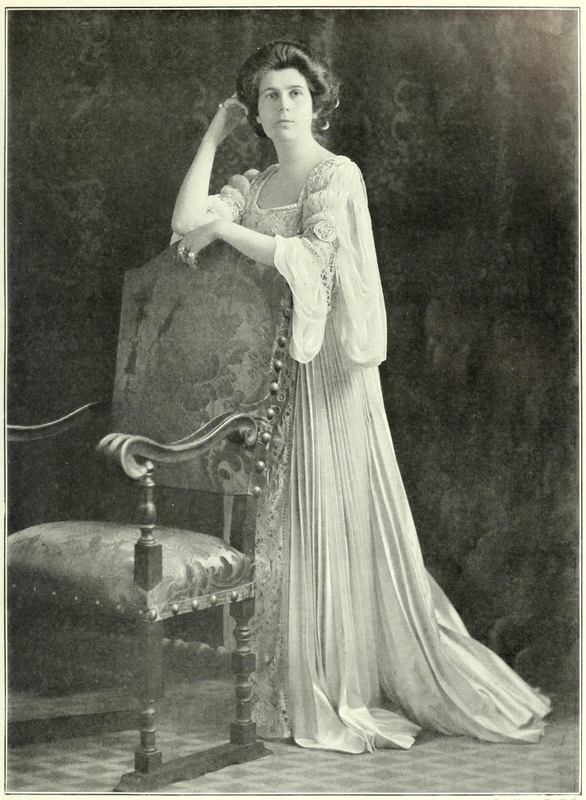 Miss Elkins, engaged to the young Duke of Abruzzes. Mrs. H. Chapmann, whose receptions are famous. Mrs. Clarence Mackay, owner of the castle of Roslyn, is one of the richest women in America. At the same time she is a convinced and very determined feminist. Her fortune is more than one billion. Mrs. Clarence Mackay's Castle Roslyn. -- This castle of simple and austere lines was built on the model of Maisons-Lafitte Castle. It is known in America for the richness of its furnishings and its collections. Roslyn Castle. -- The large staircase, remarkable for its superb sculptures and railings. 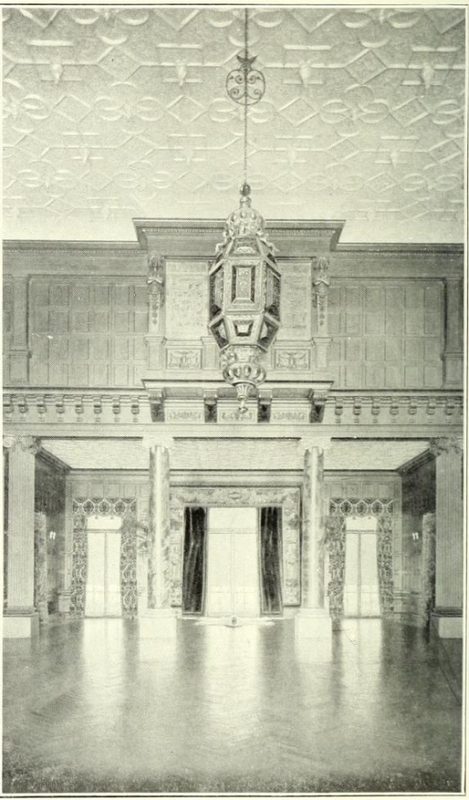 The hall. -- An immense room both imposing and cold, built like the guardrooms of our French castles. 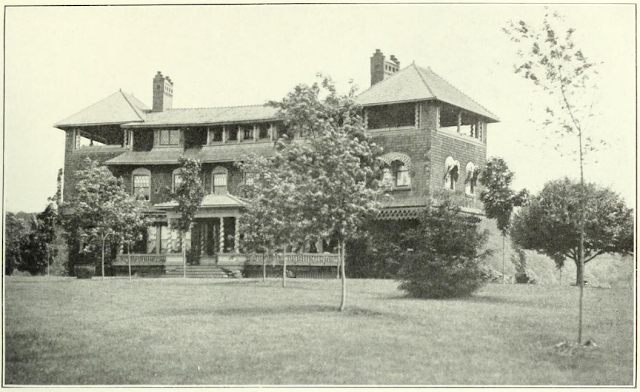 Typical American country house. 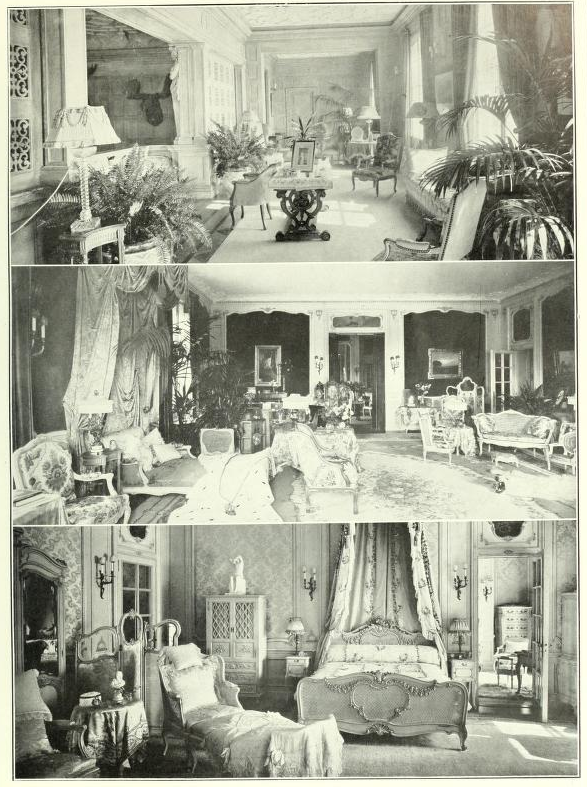 -- The American, when building his country houses, is constantly concerned with hygiene and comfort which nevertheless does not preclude a concern for elegance as well. American rural architecture. -- A particularly curious aspect to rural American architecture is the frequent and bizarre merging of Greek and modern styles together. 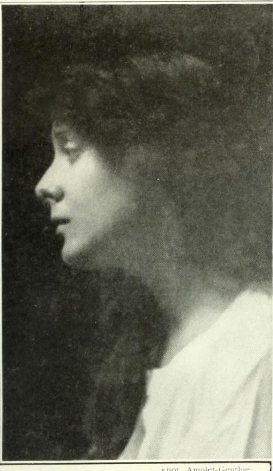 Mrs. George Gould. 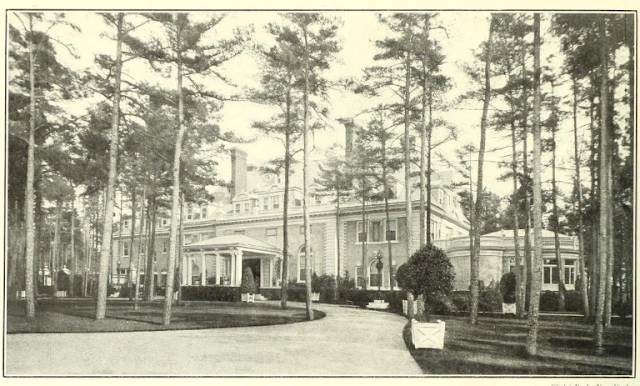 -- Mrs. George Gould is just as famous for her beauty as her fortune, for her graceful spirit as much as the splendor of the gatherings she gives in New York and in the countryside. 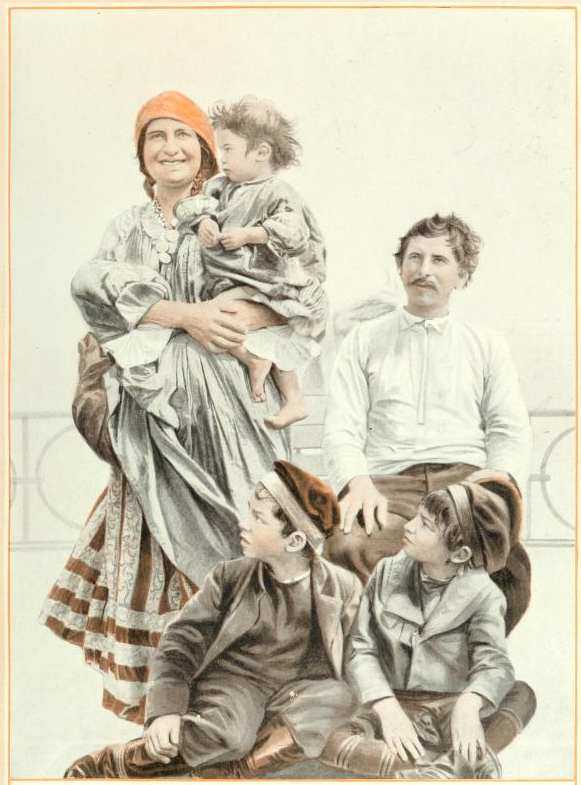 A family of immigrants. -- Just as the mirror attracts the skylark, the opulence of America fascinates the poor of old Europe, who rush in every year in thousands towards this promising rich El Dorado. A Mill's Hotel. 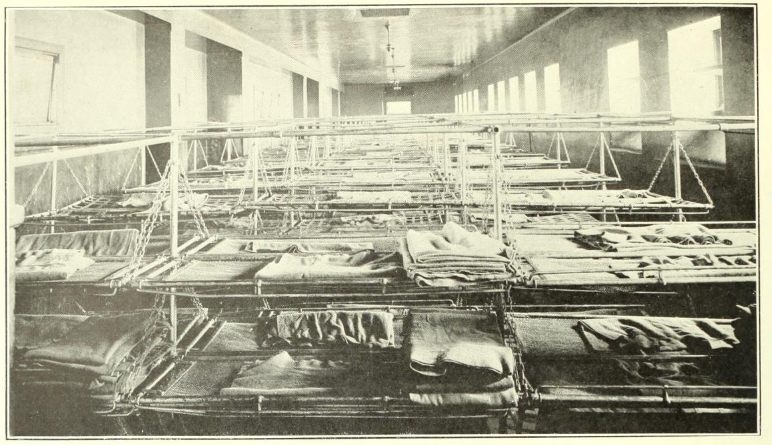 -- Mill's Hotels are not shelters but actual philanthropic hotels, very well organized that takes in for an average of twenty sous a night all those that fortune has left without shelter. A resting room. -- The inhabitants of Mill's Hotels are not beggars but rather those who have lost at life, who find there an honorable refuge and avoid contact with the dirty and low misery of the suburbs. Washrooms. -- Everything is scrupulously clean in Mill's Hotels. Numerous sinks of white porcelain with free napkins and soap are lined up against the walls in the rooms next to the sleeping rooms. 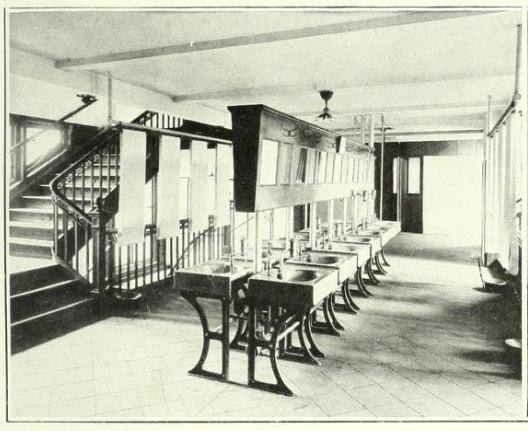 Comfortable toilets are also set up in the foyer preceding the eating rooms. After eating, the client has available to him a spacious reading room with a great number of books and newspapers. The restaurant. 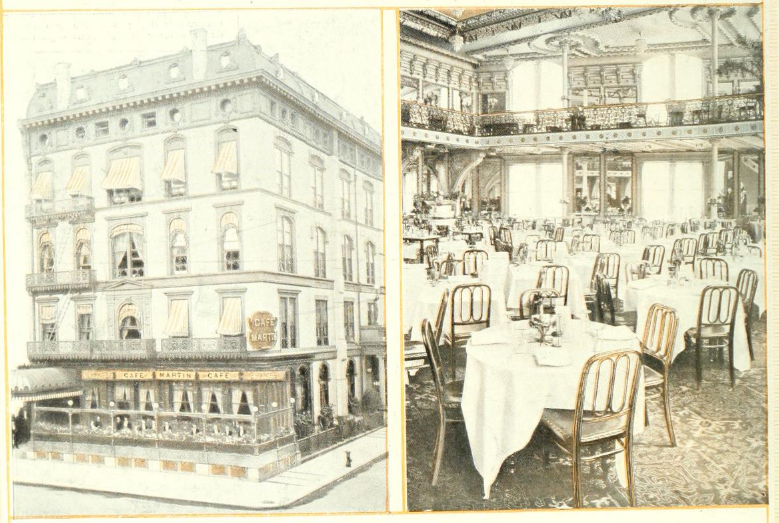 -- With a decor of a strict cleanliness, Mill's Hotels serves inexpensive meals with prices ranging from 50 to 75 cents. They are healthy and the portions are large, but all alcoholic beverages there are strictly forbidden. Ellis Island. 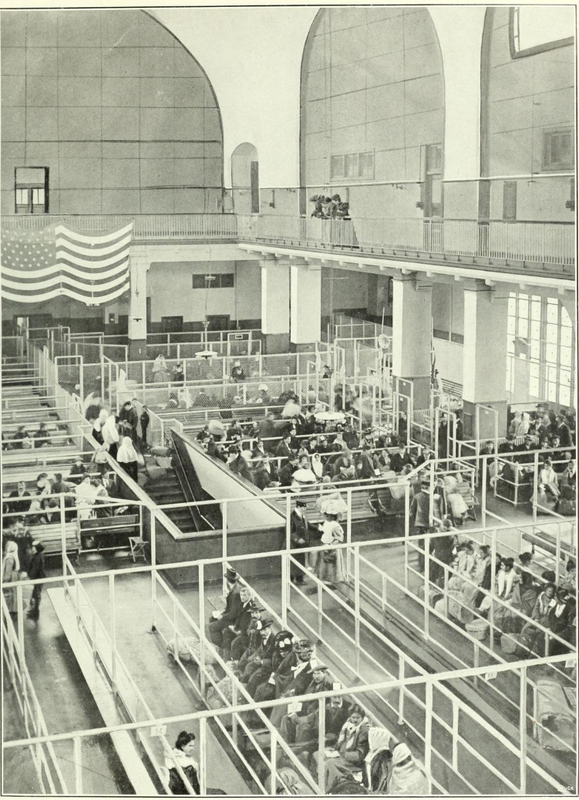 -- The antechamber of the Promised Land: in this kind of monumental quarantine chamber set up on an island in the middle of New York Bay that all the immigrants have to pass before arriving in America. First contact with America. 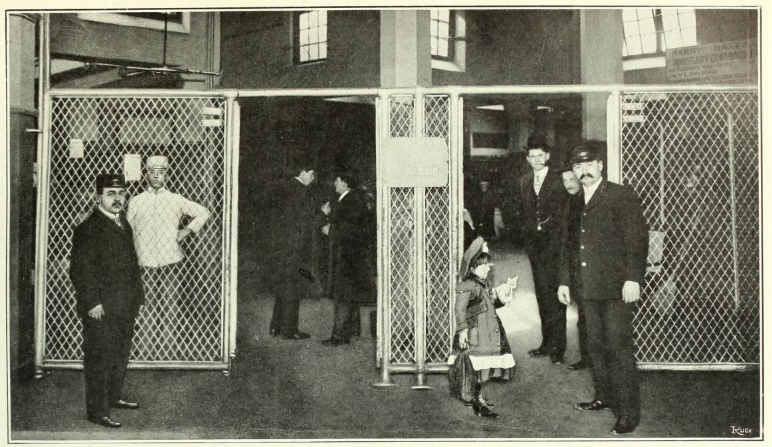 -- The immigrants disembark in a large hall, with multiple counters. There they must declare their identity and their destination. American hospitality. 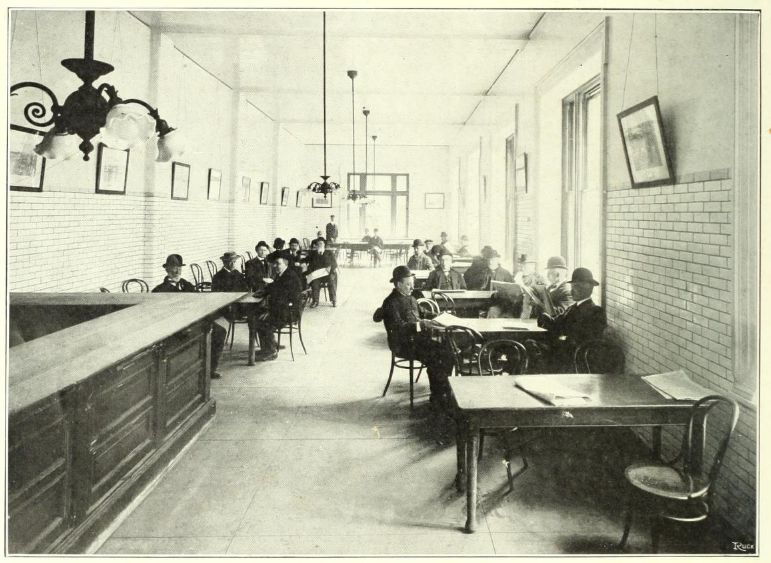 -- After finishing the formality of identification, the immigrants hurry to the free meal served by the administration in a spacious and bright dining hall. Separation compartments. 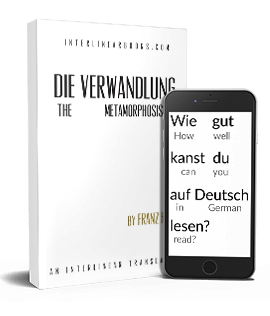 -- The immigrants are divided into different rooms according to the train lines they will have to take to get to the provinces that are often very far off in the interior. Medical visit. -- The immigrants line up before government doctors who examine them, look in detail at the state of their eyes, mouth, scalp, etc., and measure their height. Types of immigrants. 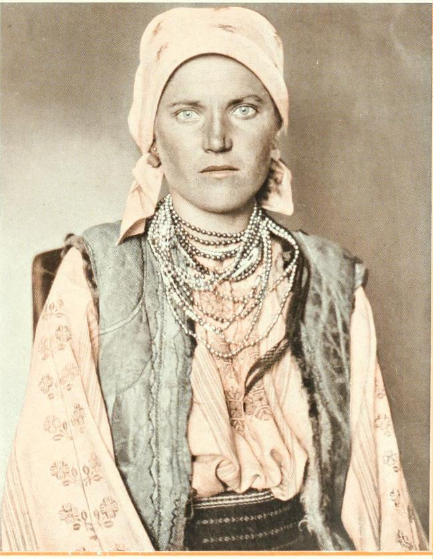 -- Romania sends a large number of immigrants to America every year, eager to make something of themselves. 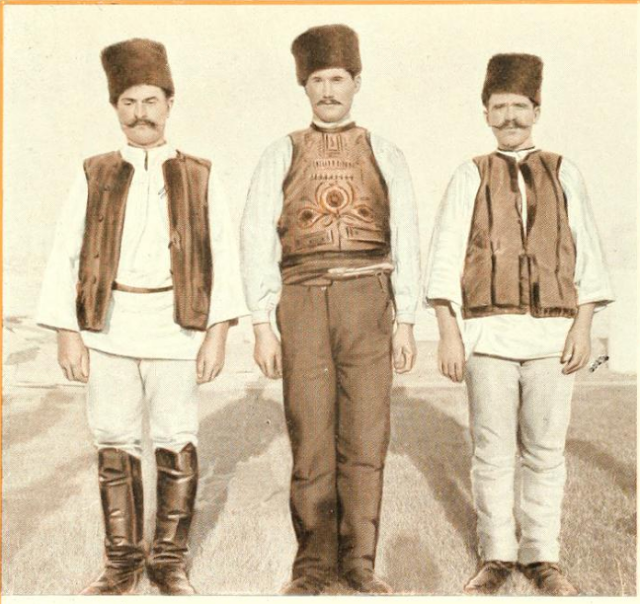 Armenian shepherds also come in large number to devote themselves to agricultural work. 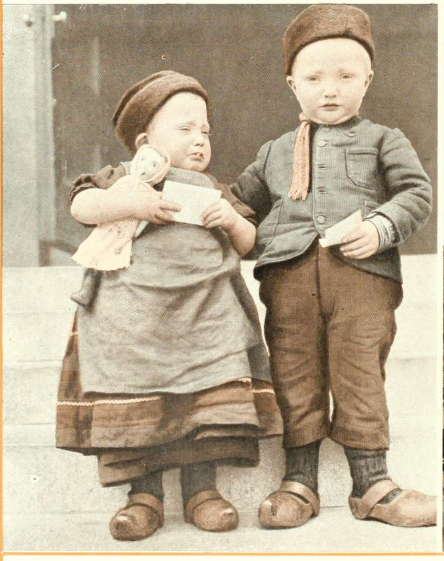 These little Dutch children brought to America have homesickness in their eyes. Oriental finery sometimes gives off a joyful note amongst the sadness of the surroundings. Getting off at Ellis Island. 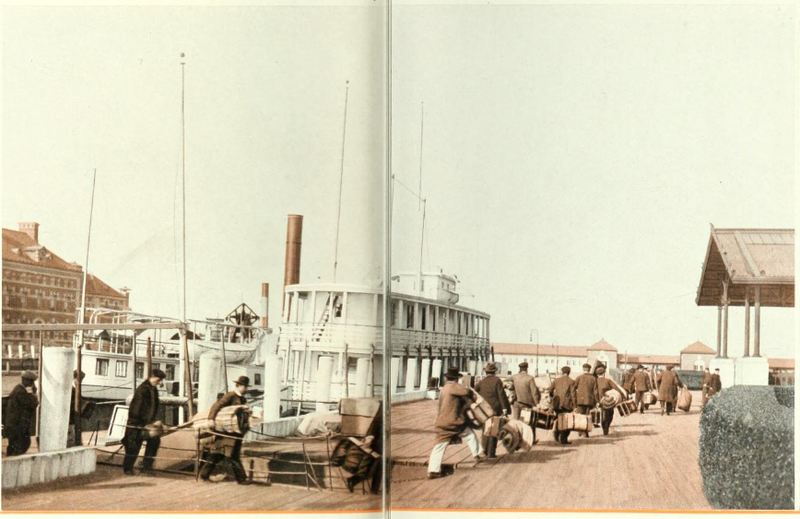 -- The immigrants carrying their supplies get off the ship and hurry toward the rooms where they will undergo the formalities to register themselves and have a medical visit. The sleeping room. -- At night on iron wire mattresses the sad human herd comes to rest, with dreams of richness, to gain repose and to forget the fatigue of the journey. 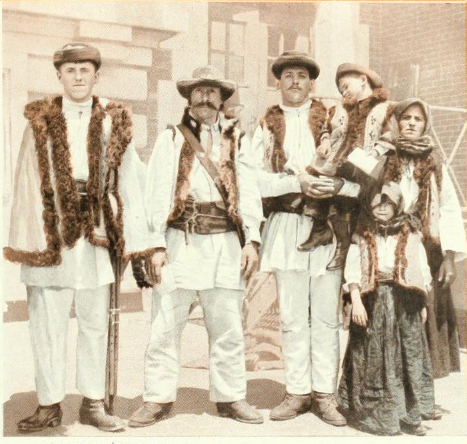 A family of Boer immigrants. -- Many families from Transvaal left their farms after the war and have come to the central provinces of America to exercise their agricultural qualities. Health inspection. -- Given a number and sent off to different areas, immigrants await the moment to show themselves before the doctors that will decide on their admission to America. A child tribunal. 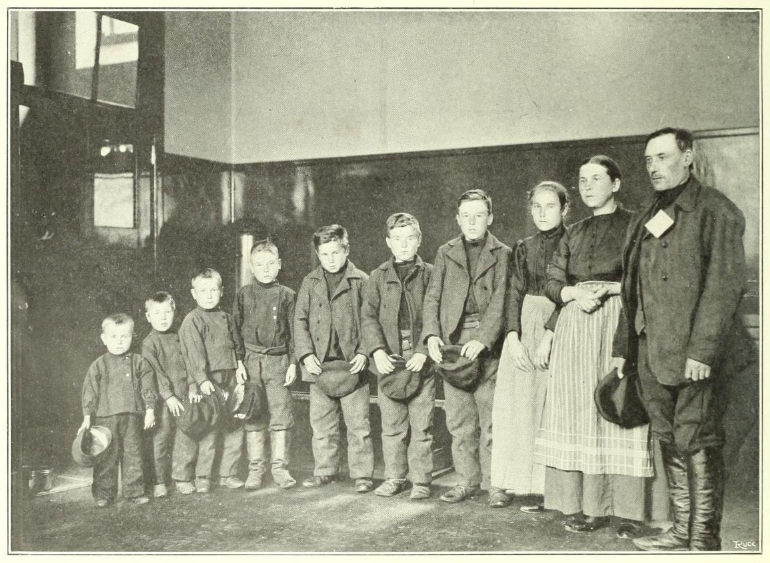 -- A child not accompanied by his parents can only disembark at new York with someone who adopts him before the tribunal and guarantees to provide for him. 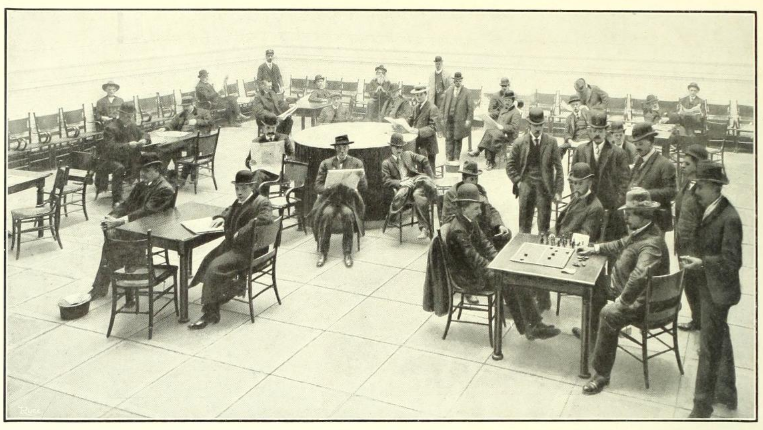 On the rooftops of Ellis Island. 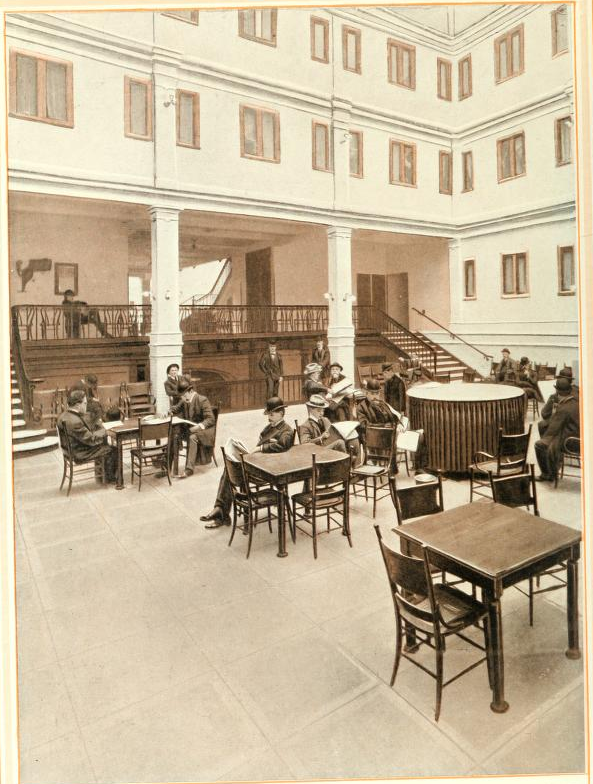 -- A welcoming administration has transformed the rooftops of the central building into a playing yard for children who must stay on the island before being allowed to disembark. The refused. -- Not everyone who wants to get in can get into America. The unfortunate ones with physical defects are pitilessly pushed back from this promised land that they have come so far to see. Sadly these pariahs wait to go back to Europe. 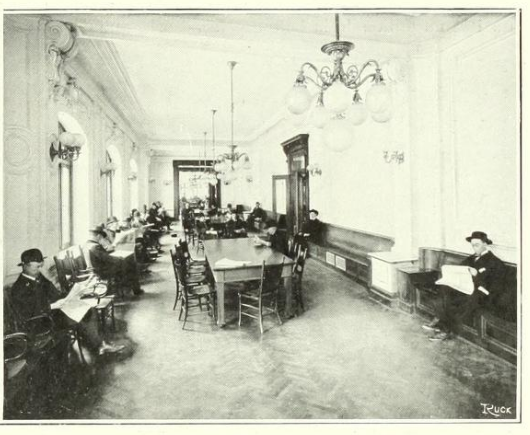 Waiting room of a Mill's Hotel. -- Wrecks and victims of the fight for life, the clients of Mill's Hotels find a relative comfort there which softens their deprivation. 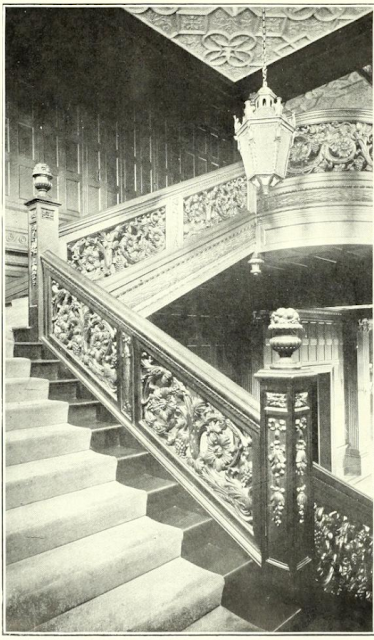 Cast iron. 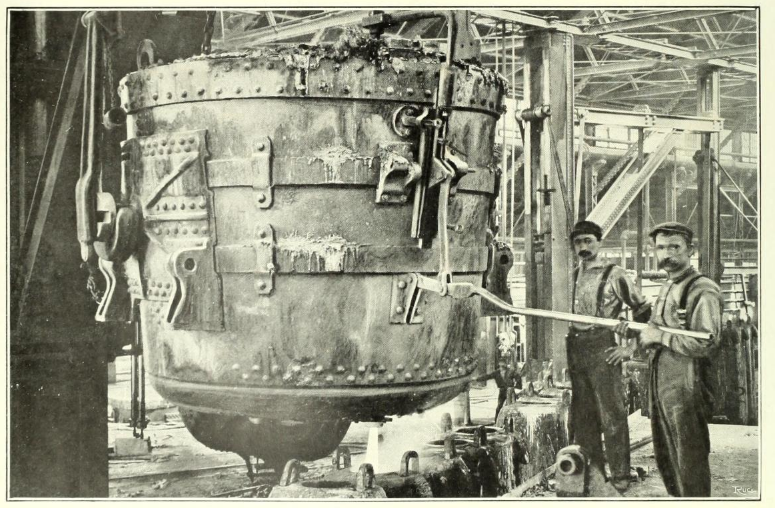 -- The melted metal goes through the gaping mouth of the furnace like glowing broth which then is poured into ingots. 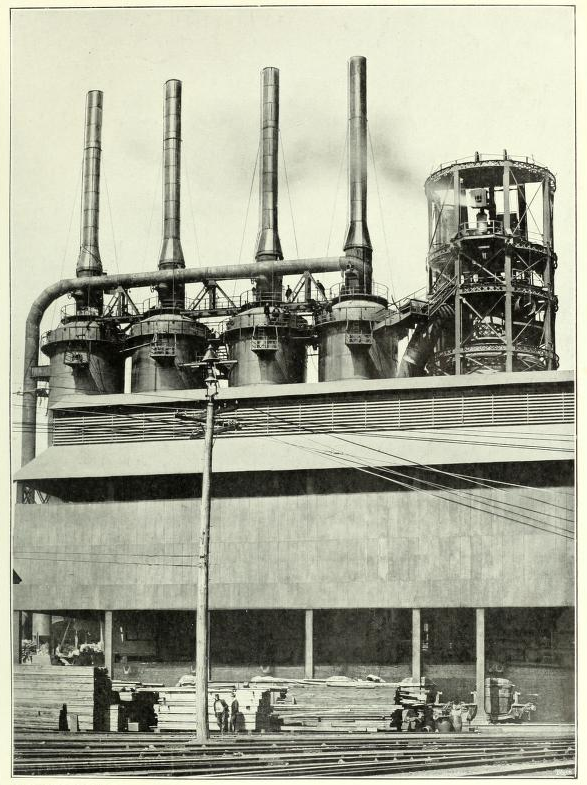 The blast furnaces of the Homestead factories. 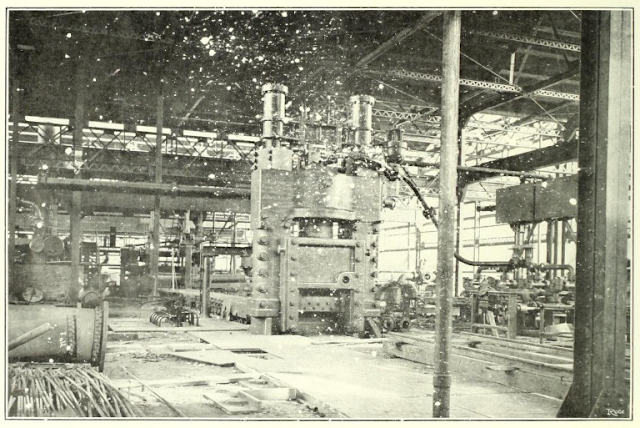 -- This photograph shows the blast furnaces of the large American factory, with automatic loaders that ensure an uninterrupted movement. Edgar Thomson factory. 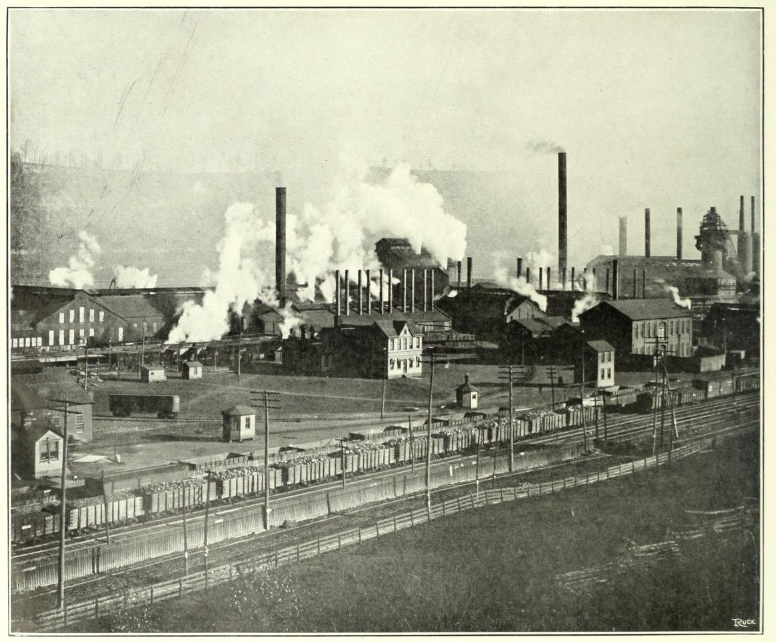 -- This factory belongs to the Carnegie iron trust. Here is where almost all the rails that crisscross America are produced: 60 km of rails leave the factory every day. Gas condensers. -- Each blast furnace is flanked by a condenser with four chimneys. 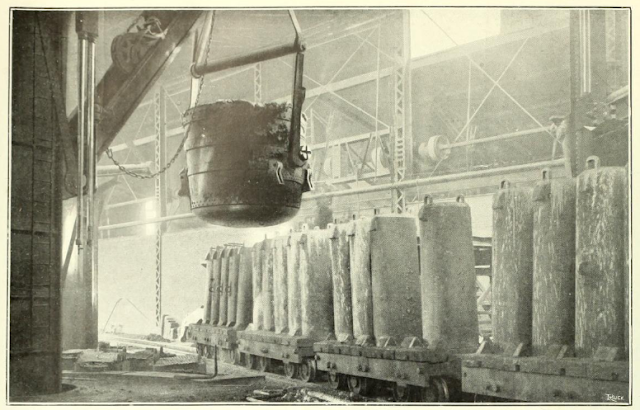 This apparatus condenses the gases produced, purifies them and lets them be used for industrial heating. Loading deck. -- This powerful machine picks up incandescent ingots of 7000 kg from the furnaces on the right that it places with a rotating motion of the arm on the trolley seen on the left. 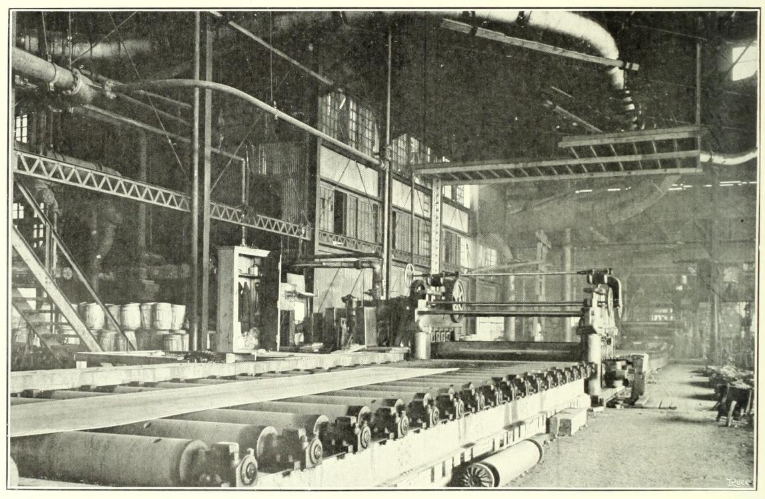 Rolling mill for armored plates. -- With a single blow of their powerful blades the hydraulic scissors cut iron plates, reaching at times 30 inches in thickness. 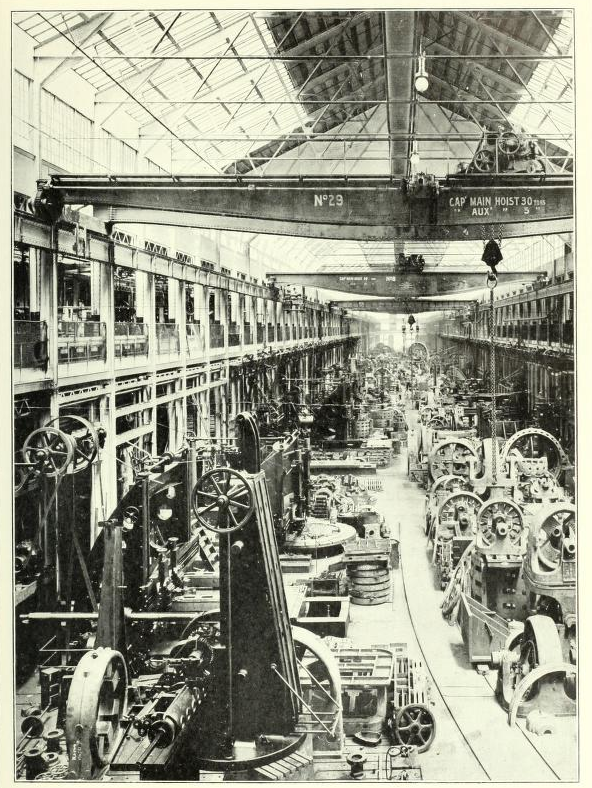 Part of the Westinghouse factory. -- The Westinghouse factory from Pittsburgh is known throughout the world for its fabrication of electric wheel and hydraulic equipment. It employs thousands of workers. Inside a steel plant - a rolling mill. -- Moved by the conveyor belt shown here, a 7000 kg block of steel moves towards the spools that will turn it into a thin plaque. 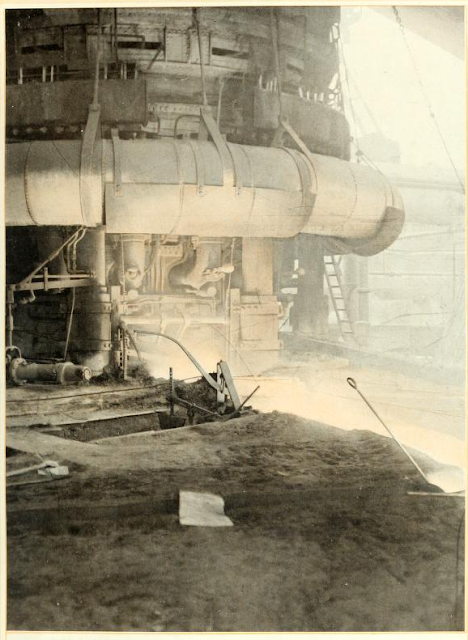 Steel smelting. -- As soon as it leaves the blasting furnace the melted steel falls into an enormous pocket of metal called a "cup", which it pours into the "molds" on wagons. Filling the molds. -- The pocket full of molten steel is above. Using levers an interior valve below fills the molds with the metal. The large assembly hall in Westinghouse factory. -- Inside this immense hall, half a kilometer long, motors and electric generators are lifted and moved by rolling cranes of 30,000 kg. Rolling mill for 128 inch plates. -- The large steel factories have rolling mills of different strengths depending on the thickness of the plates. Calibrating mill. 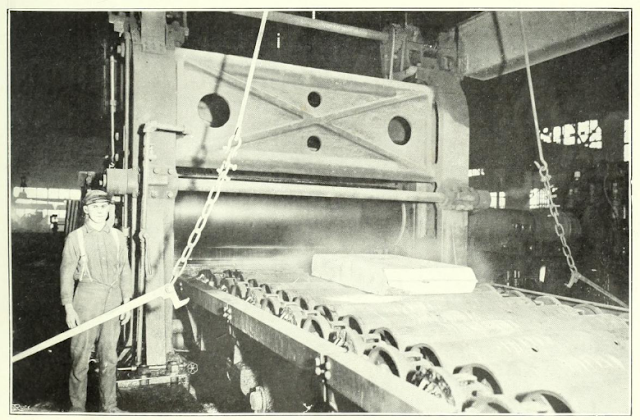 -- Once the plates have the desired thickness, a final mill seizes them and puts them on the roller for the machine that cuts them to the correct caliber. 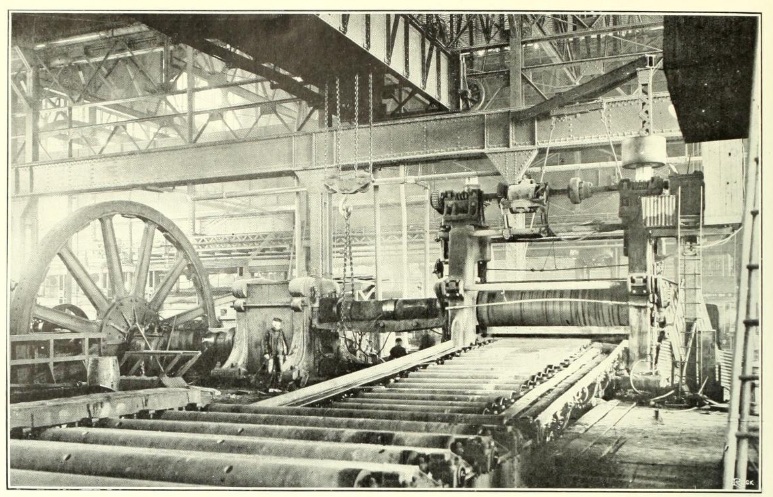 48 inch rolling mill. -- Under the double embrace of the mill rollers and their formidable compressive strength, the largest blocks of steel are slimmed down to sheets of tiny thickness. Sheet metal scissors. -- The steel sheets pass underneath the cutting scissors that cut them to the desired size. 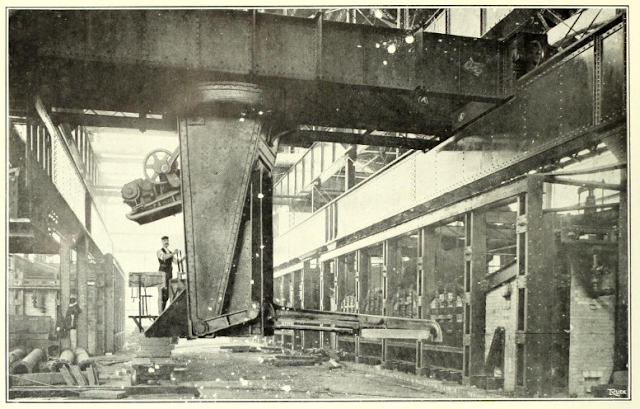 Rolling mill for armored plates. -- The large armored plated are thinned down by a large mill of a formidable strength. The city of iron. 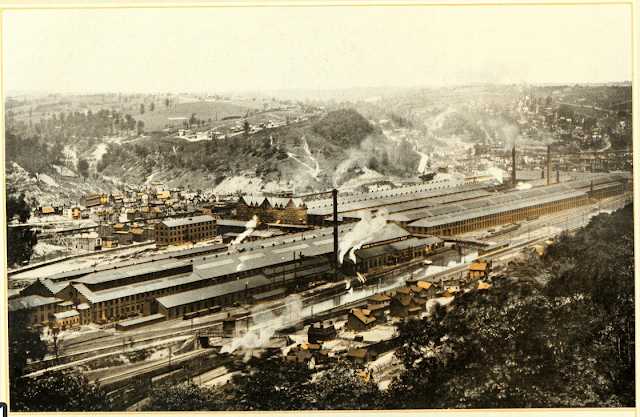 -- Pittsburgh is a disproportionate and fantastical city, bristling with chimneys of factories that spew out flames, shaken by the noise of the colossal forges, the noise of locomotives, of hoists, of whistles and by the cyclopean panting of of giant boilers where the melted metal bubbles.